As expected, lows this morning have only fallen to around 60 degrees, amid foggy, misty conditions. Skies will clear out before more rain returns later Friday ahead of a strong cold front—although the front is now looking not quite so strong as anticipated, and most of the region seems unlikely to see a freeze. It will still be plenty windy. After a gray, drizzly day on Wednesday, the exit of low pressure should allow some clearing of our skies later today, and this afternoon could be pretty nice. With partly to mostly sunny skies later today, look for a high in the low 70s. Lows tonight should be in the upper 50s for most of Houston as clouds build back into the area. This should be a mostly cloudy day, as southerly winds help to build up humidity and moisture in the air. Any daytime rain showers will likely be isolated or scattered, as highs climb into the low 70s. 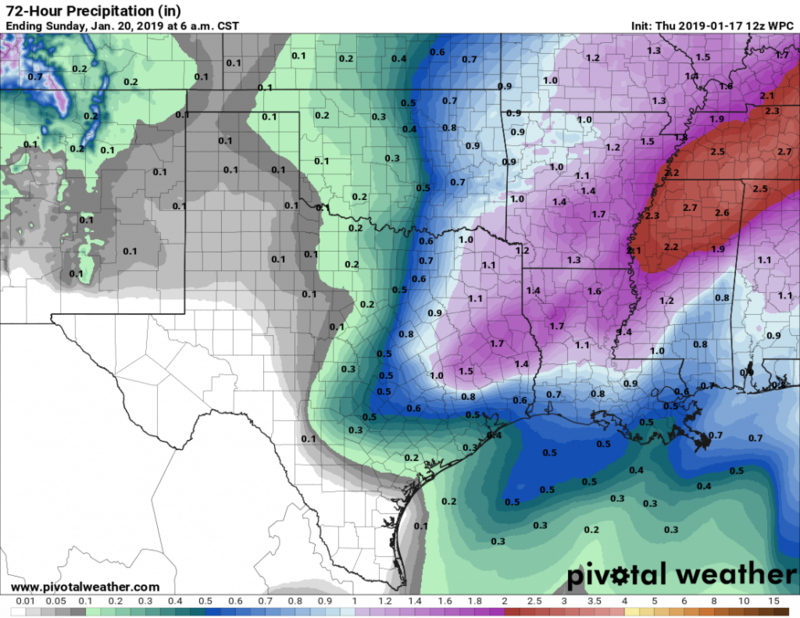 Significantly better rain chances—probably 80 to 90 percent—will move in Friday night, with a line of storms likely crossing the area between midnight Friday and sunrise on Saturday. Expect accumulations of 0.25 to 1.0 inch of rain for most of the area, as some of these storms will be briefly capable of producing heavy rainfall. Temperatures will fall quickly after the front’s passage Saturday morning, and rains should end by around mid-morning, if not earlier. We’ll be left with a breezy day, as temperatures fall from the 50s into the 40s even before sunset. With winds gusting up to 30mph, this will not be a particularly great day to be outside—it will in fact be rather unpleasant. 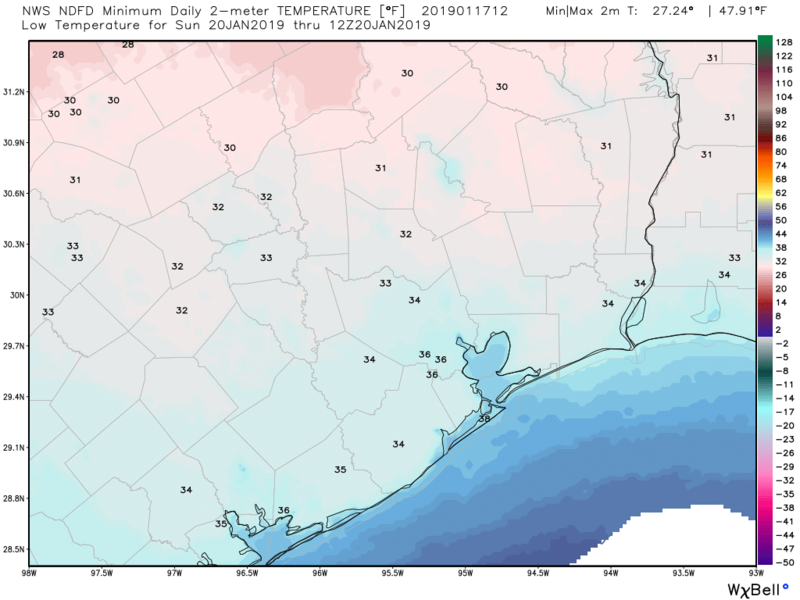 Temperatures Saturday night will probably fall into the mid-30s for most of Houston. Because the cold front is now arriving a bit earlier than expected, we can have some hope for a bit more mild winds on Sunday morning. In fact, if you’re a cold-weather runner, conditions are looking increasingly ideal for the Houston Marathon, with start-line temperatures likely around 35 degrees, with perhaps a 10mph northerly wind. (This is much better than the forecasted 20mph wind of a couple days ago). Highs on Sunday should get up to around 50 degrees under mostly sunny skies, with winds slowly backing off. We anticipate 100 percent clear skies on Sunday night, which will be ideal for the total lunar eclipse. A partial eclipse will begin at 9:33pm CT in Houston, with a full eclipse from 10:41pm lasting until 11:43pm. During this time the Earth will pass between the Moon and Sun, bathing the Moon in an eerie red color–sometimes called a blood-red Moon. Temperatures during the eclipse should be around 40 degrees, with lows Sunday night falling into the upper 30s. Monday should be a pleasant day, with a high of around 60 degrees and sunny skies. Some rain chances return on Tuesday and perhaps Wednesday ahead of the region’s next cold front, which should bring more cold but not freezing weather to the region. Eric, we’re halfway through January and IIRC we haven’t had a freeze yet (at least not down in our corner of H-town). Is it possible we might actually go all winter and just….not freeze? Is there precedent for that? It is not unprecedented for the southern half of Houston to go without a freeze during winter. When I first moved to Houston, winter never had a freeze, never had to worry about pipes, ice on the road, or anything. It seems that the prediction for the cold snap this weekend is not predicting as cold as it was initially. Eric – I’m in Spring, east of 45 between 1960 and Cypresswood. We will be spending the night downtown Saturday because my husband is running Sunday morning. Do you think I need to cover my plants before we leave Saturday? Or will it not get cold enough to do much damage? Hi Donna. For Spring it is going to be a close call, but right now the models are trending pretty strongly against a freeze. Water your plants. You might lose foliage, but if the roots freeze, you will lose the whole plant. Eric, thanks for all of the great information. I live in the Cypress area and am wondering how necessary it us to wrap my pipes and sprinkler valve pipes. Thanks again! When in doubt, cover that spout! So pleased to learn your partnership with Reliant will be continuing – that is great news – Congratulations! Check our the Houston marathon page at findmymarathon.com. They don’t do a course overlay, but you can put in your projected time and they’ll tell you what general direction the wind will be blowing and the temperature between various mile markers for you. Any predictions on how quickly the temperatures will rise for the marathon? I’m looking for the hourly breakdowns. Still trying to decide if it will be shorts or pants on race day. Thank you for the detailed forecasts! !